SINGAPORE’S economy turned in a better-than-expected report card for the third quarter, which led several economists to upgrade their full-year growth forecasts. Now in its fourth year and supported by the bank UBS Singapore, the award seeks to recognise Singaporeans whose extraordinary acts of goodwill have improved their community and the lives of others. MORGAN Stanley has predicted an 8 per cent increase in private home prices in 2019 despite cooling measures introduced in July to tame the market, a projection that stands in stark contrast to other research houses’ much tamer outlook. Singapore private home prices may rise as much as 10 per cent by the end of next year said Morgan Stanley analysts in a note to clients on Friday. The better reliability and connection speeds that the new submarine cable provides has helped to attract the interest of Internet service providers (ISPs) here and abroad. Standard Chartered Plc (STAN.L) is “actively working” on options for its stake in Indonesia’s PT Bank Permata tbk (BNLI.JK), the British lender’s Chief Executive Bill Winters said on Saturday. Will the services sector buoy Singapore’s GDP amidst manufacturing’s slumping growth? Leader of the political party Singaporeans First Tan Jee Say has asked if the People’s Action Party (PAP) representatives – Members of Parliament and Ministers, including Prime Minister Lee Hsien Loong – will declare their assets publicly. Singapore Technologies Engineering has won a S$7.5 million ($5.5 million) contract for the trial of a smart lamp-post project in Singapore, which includes fitting sensors and cameras to posts in the city-state, according to the government’s official tender website. GO-Jek – which will enter Singapore in November – is on course to build an empire of over 20 business verticals and take on Grab to become South-east Asia’s most inclusive Super App. AS interest rates perk up and bond yields rise, investors betting on Reits and other erstwhile defensive “bond proxy” dividend stocks for income are being forced to rethink their strategies. THE US-China trade war may lead to more diverse trade flows, said a senior Citi banker. Singaporeans’ inexplicable love for mala hotpot has spread to tidbits, with two new local brands — Mala Mala and Ooh — offering mala-flavoured potato chips. A planned US$10 billion (S$13.8 billion) currency swap deal and US dollar repurchase agreement between Singapore and Indonesia will boost confidence in uncertain times, say analysts. The taxman has told 145 doctors and dentists and 32 medical groups that their tax returns are under scrutiny, for reasons such as setting up companies to enjoy a tax break and claiming family holiday expenses. More than 20,000 signed up for a 28-day programme run by the Health Promotion Board (HPB) to quit smoking last year, but only about 10 per cent stayed away from cigarettes for the entire duration. A musical performance by President Halimah Yacob and her husband Mohamed Abdullah Alhabshee was among the highlights of the President’s Star Charity show last night. The event raised about $8.3 million – a record since the event began in 1994. President Halimah and her husband performed with The Purple Symphony, an orchestra that includes musicians with special needs. Proceeds will go to the 59 charities under the President’s Challenge 2018. The agency’s study would look at how far the pigs move in search of food, population densities, family size and reproduction rates. As a primary school pupil, Janine Shum felt like she was invisible, and frequently overlooked. Will technology or humanity be the great leveller? There is even some empirical evidence of this. According to a report published last month by the ASEAN+3 ­Macroeconomic Research Office (AMRO), highly skilled workers experienced the fastest-growing wage gains since 2007, while wages of low- and medium-skilled workers barely budged. The report was based on a study that examines the impact of technology on monthly wages and productivity gains in Singapore. The Straits Times Index’s decline during Oct 9-11 took the index below a twice tested support at the 3,103 to 3,109 range. Short term stochastics turned down from the top end of its range as 21-day RSI tested 30, an oversold low. ADX is rising and the DIs remain negatively placed. In addition, quarterly momentum is falling. SINGAPORE — Many Singaporeans may not have heard of Pulau Satumu or Pulau Semakau, but these small southern islands boast a diverse marine ecosystem of coral reefs, coastal forests, mangroves and more. SINGAPORE – Twenty-two cases of smuggled marine turtle eggs have been detected at the checkpoints since April, the Agri-Food and Veterinary Authority (AVA) said on Saturday (Oct 13). AVA said in a Facebook post that in these cases, the marine turtle eggs were meant for personal consumption. SINGAPORE – Three Taiwanese men were arrested on Friday (Oct 12) for their suspected involvement in a China officials impersonation scam in which a victim was cheated of $1.72 million. A python was seen coiled around the exhaust pipe of Stomper Khairul’s motorcycle which was parked at the void deck of Block 233 Pasir Ris Drive 4 yesterday (Oct 12) at about 5.30pm. When we arrived at Vijaya Mohan’s single-storey home in Potong Pasir, we were struck not just by how warmly welcomed we were, but also by the beauty of the myriad handmade artwork all over the front foyer of her house. Concerned about high-earning medical professionals who might be guilty of tax evasion, the Inland Revenue Authority of Singapore (Iras) has urged doctors to own up voluntarily with the promise of lower penalties. Singapore’s important concern for now is the evolving bilateral relationship between the United States and China, although it keeps an eye on development in Malaysia. ‘What happens in Malaysia is very important to us… but that is not the main strategic change – that is the imperative for the plans that we are unfolding right now in Singapore,’ says Minister for Foreign Affairs Dr Vivian Balakrishnan. Recently, food guru KF Seetoh from Makansutra published a series of blogs highlighting the dire situation those hawkers operating under the Social Enterprise Hawker Centre (SEHC) operators are in. In particular, he published an open letter to Senior Minister of State Dr Amy Khor last Tuesday (9 Oct) imploring her to preserve Singapore’s public hawker centres. So when she decided to enter the Queen’s Commonwealth Essay Competition this year, it was this experience she drew on – and the authenticity of it scored her the title of junior winner. SINGAPORE — Getting from Singapore to New York in one hop is better than a layover — even if it involves taking the world’s longest flight. That’s my jetlagged verdict after disembarking from Singapore Airlines’s flight SQ22, the return of the carrier’s Changi-to-Newark journey after a five-year hiatus. 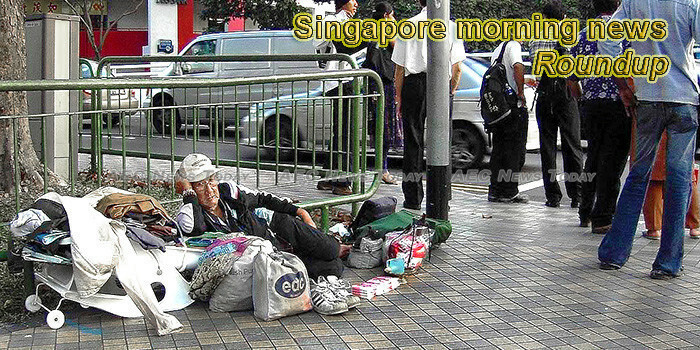 This week’s Singapore morning news feature photo acknowledges International Day for the Eradication of Poverty, October 17.